Evers on Monday released the note given to him by Walker just before he left office in January. In the note, Walker, a two-term Republican, congratulates Evers on his victory. Evers initially refused an Associated Press open records request for the document. But the governor released it hours after the AP published a story about his denial and asked that he reconsider. Evers rejected the initial open records request, saying that the letter was “purely personal” and therefore not subject to the open records law. “However, we appreciate the public’s interest in knowing about correspondence between governors, regardless of the nature of the messages,” the governor’s spokeswoman Melissa Baldauff said in a follow-up message that included the letter. “As you know, this is a wonderful state and I am positive that will continue in the future,” Walker wrote. 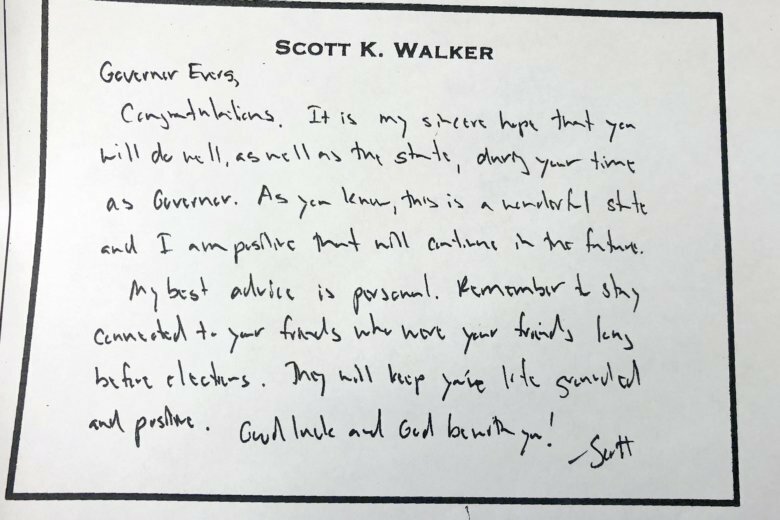 Walker told AP in a January interview three days before he left office that in the note he summarized “some pretty good sound personal advice” he got from other governors when he took office in 2011. Walker said then that he didn’t want to “broadcast” details of the note. Evers’ assistant legal counsel Erin Deeley denied the AP request on Friday. Evers provided the letter less than five hours after AP asked him to reconsider Monday, and three hours after the story about his denial was published. Evers, as justification for the initial rejection, cited a 2010 Wisconsin Supreme Court decision that said private emails are not “records” subject to Wisconsin’s open records law. The 5-2 ruling dealt with a request for emails made by a citizen to teachers within the Wisconsin Rapids School District. Lueders said Evers’ relying on that ruling to deny releasing the letter from Walker was an over-application of that decision. The Supreme Court was dealing with personal communications involving low-level employees, not a message written by one elected official and received by another, he said.